I have observed this disease in scattered commercial pumpkin and squash fields across Indiana. Bacterial leaf spot of pumpkin is perhaps the most serious disease of pumpkin in Indiana today. Symptoms: Bacterial spot causes ⅛-¼ inch angular leaf lesions that are white to light brown in color (Figure 1). These leaf lesions may be accompanied by yellowing (chlorosis). The more important symptom is the lesions on fruit that are scabby to raised, round and a light brown in color. These lesions are often less than ⅛ inch in diameter and do not extend into the surface of the fruit. However, lesions may become secondarily infected in which case lesions can become an inch or more in diameter. Such lesions may grow into the flesh of the fruit (Figure 2). Any type of fruit lesion can ruin the marketability of the fruit. Figure 1. 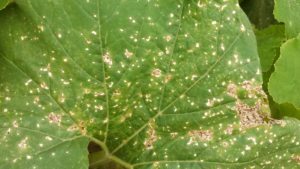 The angular lesions of bacterial spot on pumpkin leaves do not cause yield loss. Figure 2. 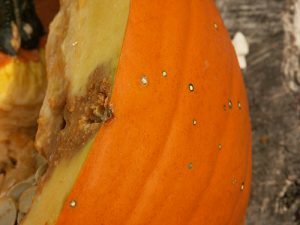 Bacterial spot can cause scabby lesions on the surface of the pumpkin. Occasionally, lesions become infected with secondary fungi and are enlarged. Biology: Leaf lesions, while unimportant economically, are important in diagnosing bacterial spot before fruit is present. This head start allows growers to begin preventive measures. The idea behind such measures is to slow the spread of leaf lesions in which the bacteria survive and grow. Fruit lesions often begin when bacteria splash from the leaf to the fruit. Fruit remain susceptible to lesions of bacterial spot until about 14 days post pollination. Management: Foliar applications of a copper product, usually copper hydroxide or copper sulfate, should be applied once the leaf lesions of bacterial spot have been confirmed or when pumpkin plants have reached the bush stage if the disease threatens. That is, don’t wait to start copper applications if one expects bacterial spot to occur either because of field history or some other factor. Applications of a copper product are more likely to be more effective if applied with a mancozeb product. Dithane® and Manzate® are mancozeb products that are labeled on pumpkins. Another product that is labeled for bacterial spot of pumpkins is Actigard®. Actigard® is a product that ‘tells’ the plant it is under attack. The active ingredient itself is not active against any fungus or bacterium. Instead, it starts the plant’s defense system. So, in the case of bacterial spot, we would hope it sends a signal to the plant to start producing plant compounds that help slow the disease. There is data to support the use of Actigard®. Otherwise, it wouldn’t be labeled. However, Actigard® can also lower yields if applied when the plant is under stress. That’s why there are specific restrictions on the label. For example, only apply Actigard® to healthy plants and do not apply more than 8 oz. per acre per year. Actigard® is labeled for pumpkins for bacterial spot and angular leaf spot as well as other diseases: powdery mildew, downy mildew, bacterial fruit blotch, etc. But I would use it only for bacterial spot and angular leaf spot. If you decide to use Actigard® for bacterial spot, Apply Actigard® once at two weeks before first female flower and again at first female flower. All the fungicides in the world, however, will not reduce bacterial spot problems if there has not been proper crop rotation. After a pumpkin crop, growers should keep fields out of cucurbits from 3-4 years. This is, perhaps, the most important management decision for bacterial spot. The literature on the seed borne nature of the bacterial spot pathogen is not clear. However, it makes sense not to save seed from pumpkins that were grown in a field with bacterial spot. Closely monitor seedlings for symptoms of bacterial spot. I will be happy to answer any questions about bacterial leaf spot of pumpkins or any of the compounds mentioned.